WSLHD Quality Awards entries close soon! The Western Sydney Local Health District (WSLHD) Quality Awards close on May 31. Have you submitted your entry? If not, talk to your manager to finalise your submission now! This year the WSLHD Quality Awards will be held at the grand pavilion at Rosehill Gardens racecourse on September 13 at 6.30pm. Western Sydney Local Health District clinical governance director Luke Sloane said teams or individuals will be judged and awarded for their improvements in the delivery of healthcare. “This year we have introduced eight categories and four peak awards,” Mr Sloane said. “I expect many departments and services to submit entries because I’m aware of many great innovative and brilliant projects and practices within the district. 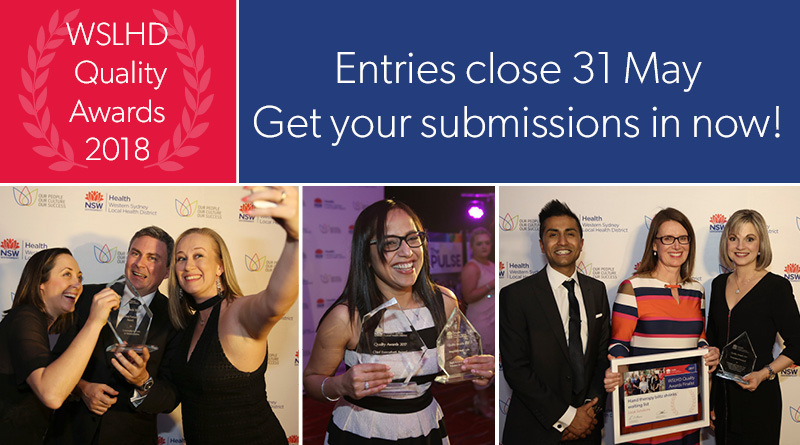 Selected projects will be submitted for further recognition at a state and national level as part of the NSW Health innovation Awards, the NSW Premier’s Awards and the Australian Council on Healthcare Standards Quality Awards.